Make your competition green with envy this March! Get agency-quality marketing at a small business price. 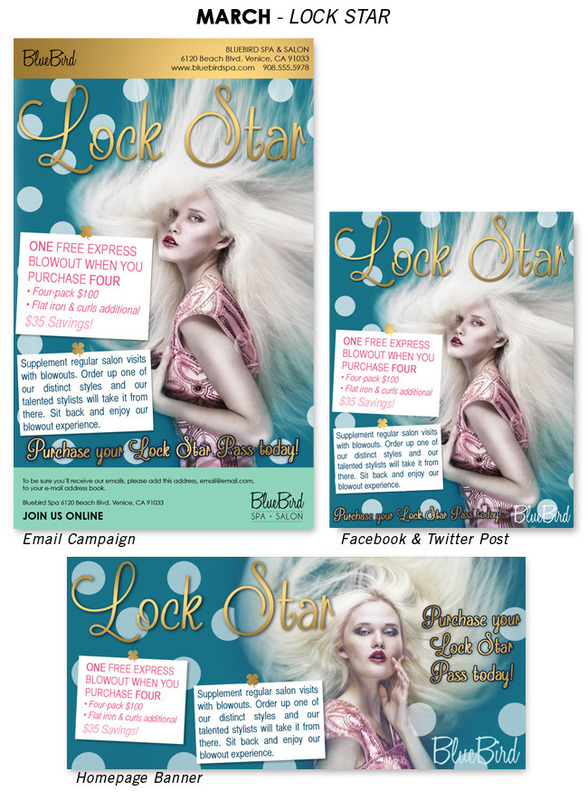 We offer stylish, professionally crafted promotions pre-designed by the beauty experts at BeautyMark Marketing. Reap the rewards of our beauty expertise and professionally crafted marketing plan with monthly promotions. We have developed a 12-month marketing plan, complete with salon marketing tools for each month of the calendar year. Visit here for more information. St. Patrick’s Day (March 17) may not be the retail giant of Valentine's Day, yet with clever incentives you can welcome clients with a festive salon experience throughout the month of March. Make your competition green with envy! While green is associated with shamrocks and leprechauns, emerald green is the color du jour. We love this sophisticated jewel tone accented with gold used throughout merchandising, retail spaces, window displays and signage to make the salon experience modern and magical. Vignette displays are small scenes that are grouped by color or theme, the purpose is to show-off your "wares" in a fresh way each time a client visits; the average salon visit is every 6 to 8 weeks. This type of merchandising requires a little planning and a few "props" to add personality to salon displays. Get Lucky: A fun shopping atmosphere sells more retail and adds to the bottom line. Tempt shoppers by mixing retail product with eclectic props such as hard back books in shades of green, green glass cake stands, "pot of gold" references such as gold coins, gold-finished vases, and framed luck-reference quotes. Great resources for props are Target, T.J. Maxx, antique or thrift stores. Reference the green-themed holiday with charming elements such as clover shaped point of sale signs - make sure to clearly state product and price information you wish to highlight, to both inform and encourage purchase. We love to mix-in small bouquets of live clover in pretty gold finished vases, or pots of moss to accent March merchandising displays. Add a "luck-themed" Selfie Station in your salon to play up the month's holiday. What is a Selfie Station you ask? It's a cool staged place or space in your salon specifically designated for clients to take selfies – just make sure you include your salon logo and hashtag. Green is the traditional symbol and color for environmentalism and Mother Earth. Create a "green" email campaign that highlights your salon’s sustainability efforts, environmental themed information, or news. This is a great tie-in opportunity if your salon co-brands with an environmentally-conscious brand such as Aveda. Make “lucky” the social media theme for March, post quotes about luck throughout the month. Ask social media followers why they "feel lucky”, post reasons why you and your salon staff feel lucky. Create a special lucky hashtag so you can track your efforts. Considering retail has a considerably higher profit margin than services, focus on retail promotions in March. Host "Happy Hour" retail promotion events - choose one hour, we suggest 5 - 6 PM, that features a retail discount during that hour only. A discount (between 10 to 25%) can be just the incentive a guest needs to purchase a retail product for the first time. For a large turnout promote Happy Hour to guests via social media, email newsletters and store signage. Get Lucky: Every time you sell a client retail product, client retention (for that client) increases by 30%! Need a March promotion and haven't planned it yet? Let BeautyMark help maximize your March returns. Check out our pre-made email campaigns, social media graphic posts and website banners. Don't miss out on another revenue-generating opportunity.